Kamagurka (real name: Luc Zeebroek) (May 5, 1956) is a Belgian comedian, cartoonist, painter and singer, best known for his absurd cartoons. He often works together with Johan De Smet. He is a huge fan of Frank Zappa, The Residents and Captain Beefheart. He used to play their music to his children before they went to sleep. 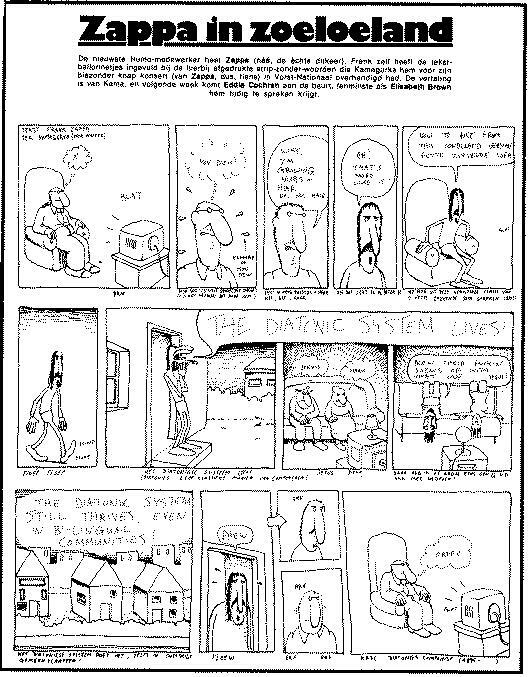 In 1976 Kamagurka met Zappa backstage at a concert and showed him a comic strip with empty text balloons. He asked Zappa if he could fill them in. Zappa wrote his own text and the comic was published in the Belgian magazine "Humo" under the name "Zappa in Zoeloeland". The cartoon references a few Conceptual Continuity gags: Sofa, Arf! and "the diatonic system." (See: Progress? on Ahead Of Their Time). A scene from Kamagurka's 1976 comic strip "Zappa in Zoeloeland" with text by Frank Zappa. This page was last modified on 25 August 2014, at 18:04. This page has been accessed 6,411 times.